An award-winning educational tool for teaching color-matching, shape-matching and pattern-recognition in a fun, game-like setting. 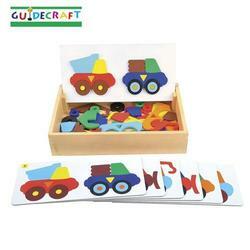 Animal Train Sort and Match includes six double-sided pattern cards, 43 animal and train pieces, a wooden storage case, and a self-propping board with pegs and metal backing to help guide the parts into place. Ages 3+. shape-matching and pattern-recognition in a fun, game-like setting. a self-propping board with pegs and metal backing to help guide the parts into place.